The upcoming Labor Day weekend will offer plenty of time to relax and enjoy with your elderly loved one. Though this time of year is typically full of family barbeques and picnics at the beach, sometimes those activities can be a bit strenuous for an older parent or grandparent. 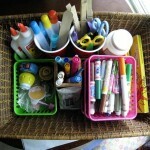 Instead, find fun things to do around the house such as crafts. Create a Memory Book: Collect some fun, colorful papers, rubber stamps, decorative edge scissors, pretty markers and punches as well as great photos of friends and family. Paint: Get large sheets of paper or a canvas as well as different sized paintbrushes and colorful paints. If you don’t want a big mess, opt for water colors. Consider setting up your loved one outside or in front of a nice big window for inspiration! Build a birdhouse: Most craft stores have all the necessary parts needed to build your very own birdhouse. If it’s too costly or involved, pick up a plain wood birdhouse and decorate it with your loved one using paints or markers. Then help them fill it with bird food and find the perfect tree to hang it in. They’ll love watching the birds fly up and eat the seed in the house they’ve created. Build with clay: Polymer clay, which can be found at most craft stores, is perfect for seniors who suffer from limited dexterity in their fingers or hands. Kneading the clay and softening it into shapes and forms is great fun and helps exercise their hands and fingers. Make a frame: Purchase a plain wood frame and small items that represent your loved ones interests. For example, if they love the beach collect several seashells to hot glue onto the frame or if they love to cook, get colorful noodles or dried, imperishable foods. For other ideas, check out this article!